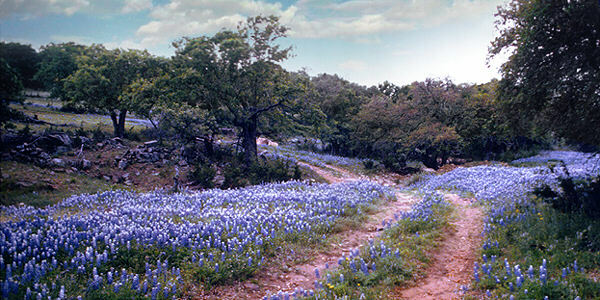 If you’re new to the area you need to know that, next to hunting season, the Bluebonnet Trail is high on the Hill Country’s list of things both sacred and secular. If you live in this neck of the woods, no matter your line of work, your well-being (sooner or later) hinges on these annual events, and both depend on the weather. Bluebonnets are finicky. Kinda demanding in a needy sorta way. To really be at their best they’ll need a good rain and hard freeze in the Winter to crack their thick shelled seeds. Snow is even better but you have better odds on a finding two needles in a haystack. Early Spring has to follow up with a few good rains. When all needs are met the landscape is a natural cathedral. And all along the roadsides you’ll see folks kneeling down on a carpet of flowers having their picture taken. Please understand, there are no experts on Bluebonnets. That’s like claiming to know all there is about womenfolk, teenagers or the stock market. They’re forces of nature — inclined to whim, chance and opportunity — and all men can do is wear camouflage and pretend to be participating. Anyway, after decades as a feature writer for Hill Country publications, I have churned out more than my share of articles on the subject, so any comparison between myself and an “authority” may have some veracity. Veracity. That’s a fancy word intended to imply that I’m a right smart feller, and if I can use it in a sentence I might just know a thing or two. I ain’t gonna dissuade you from that notion; besides I’m assuming you’re a grown-up and if you rely on my opinion you’re on your own. For years it was my task as a journalist and a “film location person” to predict if we were going to have a good season and, even under the worst of conditions, where the most abundant Bluebonnet fields could be located. One year I had the audacity to suggest that, given the drought, warm winter and such, folks would have better luck seeing Bluebonnets in their photo album. Next thing I knew phone calls started coming letting me know that a suit of tar and feathers was one-size-fits-all. But since they weren’t inclined to waste any raw materials on a five-foot-six loud-mouth I might want to come in for a fitting. It was too late for a retracraction so I just moved to the next county. Ever since I’ve been conservative in my preditions. That’s to say my comments were crafted to keep everyone happy while conceiling the truth one way or the other. All that said, I’m going out on a strong limb and predict this year will be one of the best Bluebonnet seasons on record. 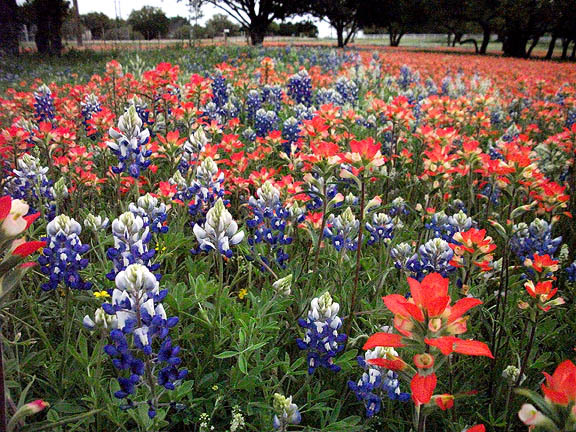 Generally, the prime months are late March, April, and early May, with Bluebonnets at their peak in April. Even after the Bluebonnets go to seed and fade away there are still plenty of wildflowers such as the Indian Paintbrush (above) in bloom to justify another road trip. It really doesn’t matter much which roads you take because this year the wild flowers are likely to be thick practically everywhere. Highways 1431, 29, 281, 71, 29, 2323 and 16 are the main thoroughfares and you can’t but help to travel those; but it’s best to branch out and explore. If you’re looking for Bluebonnets, they’re most plentiful in the northern part of the Hill Country. If you’re traveling from Fredericksburg to Llano take highway 16. Beginning at Willow City Loop the Bluebonnets don’t confine themselves to the bar ditches, but spread out into the fields. A few county roads, such as the renowned Willow City Loopjust north of Fredericksburg, Texas will be (for good reason) thick with cars. If you head that way on the weekend you’d best set aside a couple of hours due to the heavy traffic. For an out-of-the-way drive, take County Road 113 between Oxford and 2323 . Oxford isn’t even a wide place in the road, but you’ll spot the turnoff by the historic marker. There’s hardly any traffic at all on 113 and the unspoiled landscape is exceptional. The Click Route just north of the Oxford Cemetery on County Road 315 passes through some awesome hills, but you will definitely need a 4-wheel drive. Trespassing used to be a light-hearted game of catch-me-if-you-can between a landowner and the local boys without any serious consequences. Most of the time a little petty theft went along with the adventure — such as liberating pockets full of peaches, a watermelon or two, or even a few ears of corn from their rightful owners. Trespassing was a rite-of-passage where such traits as courage, stealth and stupidity where honed to a fine edge. Sometimes a honing strap was employed on the posterior of the culprit to commemorate the event. Those were the good old days. Today trespassers are prosecuted. Every now and again you’ll see a “No Trespassing” sign alongside another saying “We Ain’t Dialin’ 911”. Once I saw a “Private Property/No Trespassing” sign nailed to the gate’s corner post. At the foot of the post was a man-sized mound of dirt with two boots sticking out the end — toes pointing to Heaven. Throughout the Hill Country, county roads cut through private property. So it might not be a smart idea to stop and picnic under that beautiful Live Oak on the banks of that pretty little creek in a field of Bluebonnets. Could be a trap. A foreman I knew once surprised a city feller who was fishing on his ranch. No law was called and no shots fired. Out of sheer gratitude the feller “gave” the rifle toating foreman a new rod-and-reel and fancy tackle box. If you’re not on state or county property you’re trespassing. And while driving around it is best to remember that this is not only deer country, but cattle country as well. Likely you’ll be going through more than a few ranches. And there will be cattle in the road. Don’t honk to get them to move on. You will only attract more. Virtually all of the ranchers honk the horns of their pickups to call the cattle for feeding. Cows aren’t particularly bright critters and your horn honking will probably make them hungry enough to eat your windshield wipers. Also, there are many new calves this time of year, and the normally docile cow will become aggressive if her calf is threatened. By the way, calves are very unpredictable when confronted with acar. Just when you think the little devil is well on its way it just might dart back across the road. They’re like teenagers — with no real sense of mortality. Be warned. Hitting a cow with a car is a little like running into four or five deer all bunched up on top of each other. Or perhaps a cowhide covered brick wall. One moonless night a black cow ran into the side of my vehicle and walked away unharmed leaving a sizable dent in the passenger door that took $1,200 to repair. Also, many sightseers brake for wildlife — even if the critters are in a field 100 yards away, so be prepared to stop at all times. Apart from dodging cattle, deer, rabbits, squirrels, armadillos, skunks and vultures you best keep your eyeballs pealed for two-legged idiots. There will be cars parked everywhere — even part-way in the road — for yet another picture oftheir occupants hunkered down if a field of Bluebonnets. I’m not being critical. There’s hardly a living soul in Central Texas that doesn’t have at least of two such pictures of themselves in that situation. In fact, it’s your social responsibility to yield to the moment. Sometimes folks swarm all around their parked cars, leaving doors open, kids unattended and dogs on the loose so be extra careful. Remember, you’re driving a lethal weapon. On some county roads, such as Willow City Loop, the traffic will be jammed, and some folks don’t realize that the roads they’re blocking are used by ranching families to run routine and urgent errands. Be considerate and you’ll be welcomed. It won’t hurt to give the “Hi Sign”. Just follow these simple instructions: With one hand on the upper part of the steering wheel raise your index finger to every oncoming vehicle. That’s it. “What’s with these local chaps?” a gentleman from England once asked me. “When I wave they barely lift a finger?” He couldn’t decide if everyone was tired or lazy or both. Fact is, it’s a sign of friendship extended to all even if you’re not familiar with local custom.